Found this one at a genuine garage sale, one of eight CDs I bought for a dollar each. Most of them were for sale but this one I wanted to listen to. I also liked the packaging, which reproduces the original Decca LP jacket on the front and—as I could tell, since the disc wasn’t sealed — the original 10” issue jacket also, along with the program notes from both editions (they are almost identical) both in microtype and in readable size. I remember Peggy Lee from when I was very young. I had a 78 of her “Manana” (a novelty song, insulting to Mexicans, which she both wrote and sang) and I listened to her often through the years since. I liked an expression from the new jacket blurb, “a glamorous beacon whose sultry voice gave her performances a shimmering eroticism.” Yes. That same paragraph claims that the original 1953 10” edition of “Black Coffee” was the first jazz project by any “mainstream” singer. Maybe. The reissue notes by Will Friedland, “jazz reviewer for The New York Sun” (not exactly a prestige gig), go a lot further. 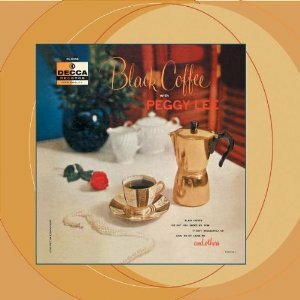 “Peggy Lee’s album ‘Black Coffee’ not only may be the greatest album of her career, it is also one of the top ten jazz vocal albums of all time.” Sorry, Will, that’s going miles too far. It’s a good album, yes, and it might be Lee’s own favorite and even her best album. But I can easily name ten better jazz vocal albums by Ella Fitzgerald, Louis Armstrong, or Billie Holliday, among others. In fact, any Billie Holliday album is better jazz than this one, with the sole exception of her very last, “Lady in Satin,” with its hideous arrangements. And what makes this a “concept album”? That all the songs have something to do with love? That they’re all accompanied by jazz ensembles? (There are two different ones, one for the original 1953 10” album, a completely different one for the supplementary 1956 tracks.) I don’t buy the idea. And if you want to hear a supposed mainstream pop singer singing jazz, try the live album of Frank Sinatra’s Australian tour with a group led by Red Norvo. That’s jazz! Too much negativity here. I enjoyed hearing “Black Coffee” quite a bit. Lee sings beautifully throughout, if not very jazzily. The two different ensembles play quite well, although there aren’t any adventurous solos. (No room, with the longest track running 3:23. Each track had to fit on one side of a 10” 78 or a 45.) The format of the reissue is entertaining, especially to those of us who remember what a Decca LP label looked like. But back to negativity for the close. This CD contains 35 minutes of music. That’s a travesty. The program notes mention that the 1956 supplementary session for the 12” version of the album resulted in six tracks, four of which were included on the LP. Where are the other two? I’m all for reissuing LPs on CD in a way which maintains the integrity of the original recording concept, so I’m glad this is not a “Best of Peggy Lee” CD with material from half a dozen different albums. But with 45 minutes of blank space to play with, Verve’s producers could have included the other two 1956 tracks and virtually any other complete Peggy Lee Decca album on the same CD. And they should have.